MICROPROPAGATION OF ORNAMENTAL SPECIES Brassica oleracea cv. Kyoto Red Given AND Ageratum sp. Ornamental red cabbage (Brassica oleracea cv. Kyoto red given) and ageratum (Ageratum sp.) are important ornamental plants which are typically grown on balconies, yards, parks and other open area spaces during summer and winter period. Approximately 156 ornamental species are produced via in vitro culture in different commercial laboratories worldwide. In vitro culture of plants is a key tool in plant biotechnology which utilizes the plant cell totipotency. In this research the effects of different concentrations and combinations of BA, GA3, IAA, and NAA on meristem buds and cotyledons as starting explants of ornamental red cabbage and ageratum was studied. For ornamental red cabbage, the highest percentage of frequency of shoot formation from meristem buds was obtained on MS + 2 mg/l BA + 0.1 mg/l IAA + 0.1 mg/l GA3 and MS + 2 mg/l BA. On contrary, the meristem buds of ageratum showed the best percentage of frequency of shoot formation on MS + 2 mg/l BA + 0.1 mg/l NAA. Cotyledons from ornamental red cabbage gave the highest frequency (56%) of shoot formation when initially cultivated on MS + 2 mg/l BA + 0.1 mg/l NAA, while the ageratum cotyledons responded with necrosis on all media utilized in the research. This research is a basis for further study for enhancement of regeneration of different plant explants from different, economically important, ornamental species. VELESANOVA, Ivana; TRAJKOVA, Fidanka; KOLEVA GUDEVA, Liljana. MICROPROPAGATION OF ORNAMENTAL SPECIES Brassica oleracea cv. 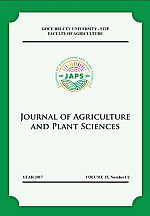 Kyoto Red Given AND Ageratum sp.. Journal of Agriculture and Plant Sciences, [S.l. ], v. 15, n. 1/2, p. 97-105, dec. 2017. ISSN 2545-4455. Available at: <http://js.ugd.edu.mk/index.php/YFA/article/view/1917>. Date accessed: 21 apr. 2019.